North Western Indian Himalayas, 570 kms. from the National capital of Delhi, in the state of Himachal Pradesh at an elevation of 2003 metres above sea level. Manali is located at 32.16°N 77.10°E . 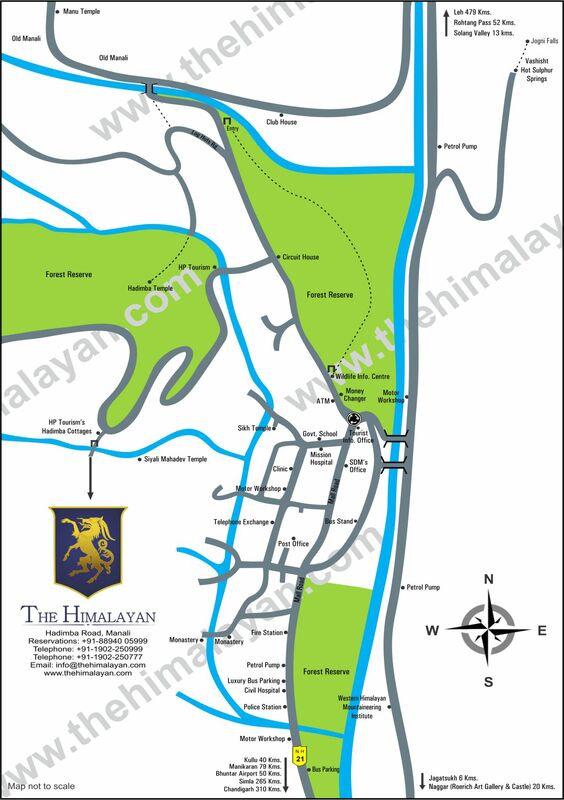 Manali town centre is a short 15 minutes walk from The Himalayan. Summer temperatures range between 26°C and 12°c. Winter temperatures vary between 12°C to sub zero. By air: A short 45 minute flight from Delhi to Kullu’s Bhuntar airport followed by a one hour 50 km. drive to Manali. By rail: Chandigarh is the most convenient railhead available. The other closer railheads available are at Jogindernagar followed by a 175 km. drive to Manali as well as Simla. The leisurely rail journey from Chandigarh to Simla is undertaken on a narrow gauge rail track and is rather pleasurable. By road: Distance from Delhi is 570 kms., taking approximately 12 hours. The distance from Chandigarh and Simla to Manali is 310 kms. and 265 kms. respectively. Regular taxis to Manali also ply from these locations. Himachal Tourism and Himachal State Transport also run regular Luxury Volvo Buses to Manali.